My sculpts are building bases and may not be solid. If you want a floor (for example), you will have to create a solid and invisible prim to add to your design. Solid and ghost prims shouldn’t be linked. Maps are editable, but I do not authorize resale “as is”, modification and use on other grids, whether public or private. This is to protect the copyrights of my designs. 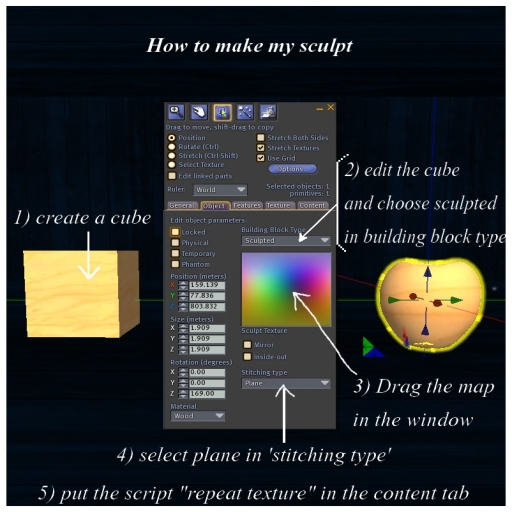 Also an excellent FAQ you can read on the Second Life wiki : Sculpted Prims: Frequently Asked Questions.